Is it September yet? 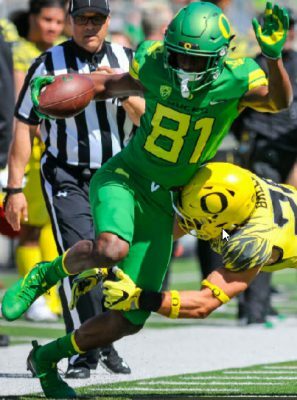 Well, no, but even though we still have to wait five months for our thirst for real college football games to be quenched, we were given a nice little appetizer in the form of the 2018 Oregon Football Spring Game. 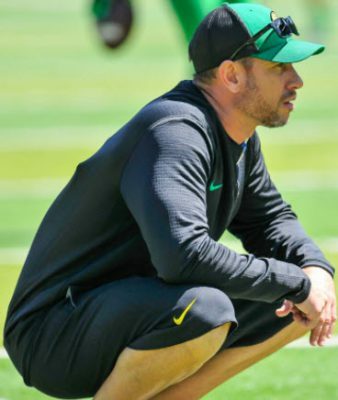 Although we played against ourselves, unlike a conventional game, we as fans gained our first exposure to the play style and feel of a Mario Cristobal-coached team. It was exciting, the weather was great (so I heard) and all in all the game left me with a good feeling for the future. So without further ado, let’s compare what actually took place to my Spring Game Wish List and see which items were checked off. There is only one appropriate place to start, and that is acknowledging the show put on by Daewood Davis in the Spring Game. Davis did an excellent job playing the football and making opponents miss on his two scoring plays. More performances like that will make him a real contender for playing time moving forward. With that said, I am not ready to jump on Davis’ hype train just yet. 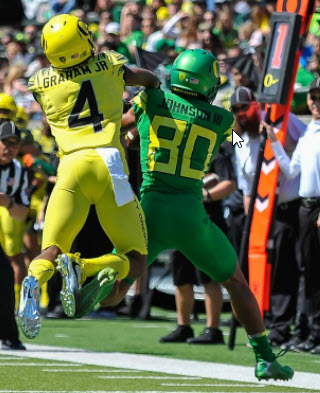 I am certainly rooting for the kid and believe he is on the right track, but I think we may have seen his peak performance in an Oregon uniform at the Spring Game, which may not be indicative of this season’s results. I will be more than happy to be wrong, but I don’t expect him to be a big contributor until next season. All things considered, the wide receiver group’s performance in the spring game was underwhelming. As far as the top two wide receivers separating from the pack? That wish list item went un-granted. Outside of Davis’ performance the only other positive was seeing how Jaylon Redd could be featured in this offense. Maybe it was just a bad day for the group or maybe our secondary is just that good (we will circle back to this later), but at the end of the day we will need much more from this group if we expect to find success in 2018. Taking the game as a whole, I do believe I saw a better version of Braxton Burmeister than what we were left with last season. He made some good throws, extended a few plays (with no fear of contact), and appeared to have a much improved understanding of the offense. Overall, I will call this wish granted. Now with niceties out of the way let’s get down brass tacks. 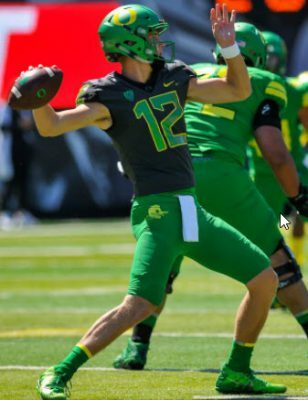 If Justin Herbert goes down, our season goes down. In my humble opinion, neither backup quarterback showed enough to give you a warm and cozy feeling that we could rely on them to win games. Each had their moments, but for all the good, I saw plenty that made me uneasy. So what does it all mean? I think we are just like the majority of football teams at any level: starter dependent. Outside of a few outliers (2014 Ohio State Buckeyes) or elite blue blood programs (Alabama) most teams in the country have a big question mark when it comes to quarterback depth. I think we are in a position where we can count on our backups to finish out (not lose) games this season, but not much more than that. I’m sure the majority of the fan base is as curious as I am about Marcus Arroyo’s offense, but we will never see much of the playbook in a Spring Game. That being said, I did like what I saw. I saw the offense trying to attack every level of the defense, and there was nice balance in the aerial attack. Justin Herbert had his struggles, but I have no concerns about him moving forward. In the end, I felt much better about the direction this offense was heading than I did a few months ago. Consider it settled. Thomas Graham and Deommodore Lenoir are the top two corners on this football team and should make a strong case for top corner duo in the conference. As for depth, Haki Woods and Verone McKinley III had a few ups and downs, but looked like solid contributors for this season. The biggest concern with this group is simply having enough depth to finish the season, which will be aided once Tim Hough steps foot on campus as a graduate transfer. While I did not see a true short yardage formation displayed in the game per se, I did walk away very impressed with how the offense handled these situations. It shouldn’t have been a big surprise to see a strong running game under Mario Cristobal, but there were multiple plays where the blocking and execution were a thing of beauty. In years past, I always had concerns about our offense’s ability to gain just a couple yards when we needed them. I don’t think I will be too worried about these scenarios from now on. If you still have doubts, I’ll just point you to the play that is still fresh in my mind: CJ Verdell’s second touchdown. I am no offensive line expert, but I can’t imagine you can get a play to look much better than that. Charles Fischer has a good breakdown of the play here. 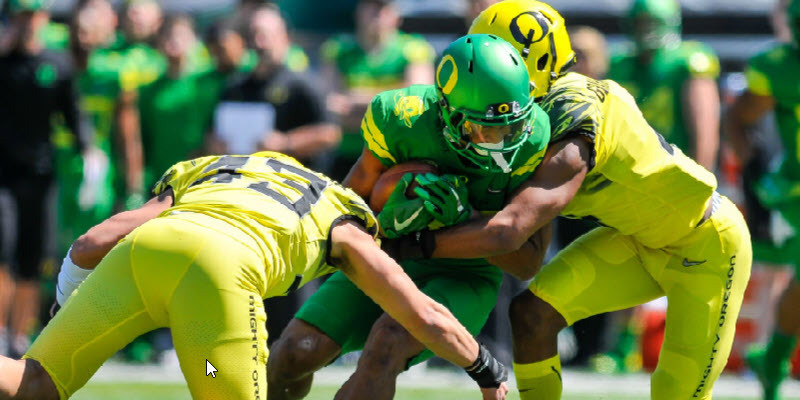 Even though we did not see the Ducks roll out a jumbo package, I feel the blocking scheme and running style utilized in this offense will yield much better results in goal line or short yardage situations. Can He Make it Come Together? I loved the atmosphere and energy of the game. The players seem to have completely bought into what this staff is selling them, and it showed on the field. The gains made in the weight room have been obvious all spring from practice videos and interviews, and showed up once more in the game. The players are in phenomenal shape, and I feel sorry for our opponents this season. The defense was playing with a confidence and intensity that I’m still not used to (but I like it). Our front seven on defense is good, if not particularly deep. But the starters are a solid unit with a little depth sprinkled in. If one or two newcomers are ready to go this fall, we will be in great shape. Whether the offense comes by land or by air raid, I know this defense will be ready. Even with the talent lined up across from them, I have to say again how impressed I was with the offensive line. It shouldn’t be surprise, with the group featuring multiple third-year starters (once healthy), but it was still great to see and shows what a team can do with essentially three offensive line coaches on staff. CJ Verdell should be the top running back this season. He runs hard, runs smart and looks like he has taken big leaps toward mastering this offense. His build reminds me of a guy who played a little to the north of Eugene—Jacquizz Rodgers. They have different running styles, but they are both short, stocky guys whom defenders struggle to track until they have been run over. If Verdell remains healthy I am expecting a big year from him. Lastly, I love the pistol formation. I love the angles is creates, I love the versatility it affords, I love how it leaves the defense guessing and I even love it with green eggs and ham, Sam I Am. I JUST LOVE IT! There is a lot of potential with this offense if run correctly. All things considered, I am very excited to see if the staff can create an effective new scheme and can’t wait to see the future of Oregon Ducks Football!